Teacher Resources > Monday Morning Ready > What gives Bugs Bunny his lasting power? Describe Bugs Bunny. Why do you think people have loved this cartoon character for the past 75 years? Based on the cartoons you've seen, do you think Bugs Bunny is a bully? Do you think Elmer Fudd is a bully? How would you describe their relationship? Do you think it's OK to play tricks on people if they provoke you? What do you think it is about Bugs Bunny's personality that allows him do that and still be loved by people all over the world? 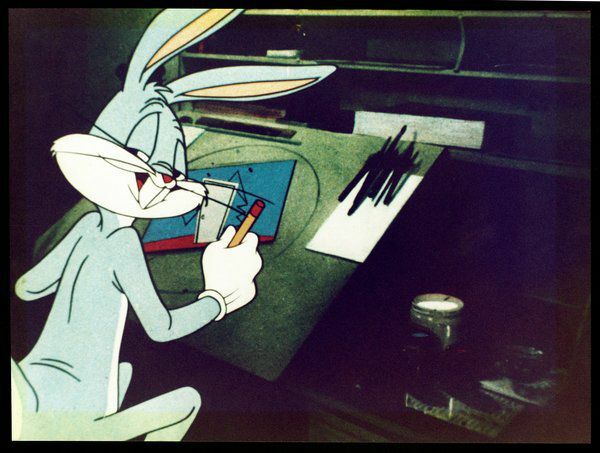 According to the article, directors wanted Bugs Bunny to be a lovable trickster rather than mean-spirited. Otherwise, they thought, he would be a bully. Do you agree with this line of thinking? Do you think the difference between a bully and someone who is just joking around comes down to intent? As a class, define the word bully. Then tell students to think about a time they've been bullied or seen someone else being bullied. Rather than describing any incidents, ask students if they wish they'd handled the situation differently. Point out that bullying is hard on everyone involved. Those being bullied may not know how to stick up for themselves. Those bullying may not know how to stop. And those watching may be torn between stepping in and stepping away. Tell students that the best way to deal with a stressful situation like this is to have a plan. Have students brainstorm ideas for an anti-bullying program in your school. Encourage them to discuss what the school needs and identify ways those things can be accomplished. Then have students write a clear set of guidelines for everyone to follow. If you wish, invite the school counselor to join the class as you complete this activity. Review the plan to ensure that the guidelines pertain to everyone involved—the bully, the bullied and those who observe the acts taking place. Discuss bullying and write guidelines for an anti-bullying program as a class. Provide art supplies and construction paper. Encourage students to write messages to inform others about the anti-bullying plan. Post the messages throughout the school. Divide the class into small groups. Encourage each group to make a list of things they think should be included in the anti-bullying program. Inform students that bullying is a learned behavior, so they should include items that will help younger students understand what they should do, too. Rejoin as a class and have groups share their ideas. Combine ideas to create one master plan. Have students present their program to students in younger grades. Divide the class into small groups. Instruct groups to brainstorm ways to deal with different types of bullying they've seen, including bullying that takes place online. As they write their guidelines, encourage them to include the names of people who can help. Rejoin as a class and have groups share their ideas. Combine ideas to create one master plan. Have students post the final guidelines on social media sites. Discuss bullying as a class. Then encourage students to brainstorm ideas about how to counter bullying through a positivity campaign. For example, students could create a Positivity Wall where they post messages to inspire others. Or, they could write positive messages on sticky notes and anonymously place them on other students' lockers. Provide whatever supplies are needed. Encourage students to continue the campaign throughout the school year. In this lesson students will engage in a group discussion intended to introduce or conclude a unit on social change, culture conflict, technology, or anthropological theory and method. This Smithsonian.com article looks at whether bullying is a result of nature or nurture. In these lessons, based on letters from young people in an Arizona internment camp, students piece together a story by comparing these primary-source documents. The documents help show that history is never a single story. How Can We Teach the World Empathy? This Smithsonian.com article examines the idea of teaching empathy and building a network of global changemakers.